Oxymelone-50 (Anadrol; generic name Oxymetholone) from Casablanca Pharmaceuticals is used for treating certain types of anemia. It may also be used for other conditions as determined by your doctor. 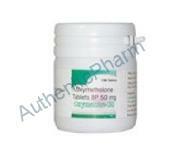 Oxymelone-50 (Anadrol; generic name Oxymetholone) from Casablanca Pharmaceuticals is an androgen hormone. It works by increasing the production of erythropoietin, a chemical in the body that increases the production of red blood cells. All medicines may cause side effects, but many people have no, or minor, side effects. Check with your doctor if any of these most COMMON side effects persist or become bothersome: Abnormal skin sensations; acne; anxiety; baldness; changes in sexual desire; general body discomfort; headache. Seek medical attention right away if any of these SEVERE side effects occur: Severe allergic reactions (rash; hives; difficulty breathing; tightness in the chest; swelling of the mouth, face, lips, or tongue); breast growth; changes in menstrual periods; changes in skin color; deepening of the voice; depression; frequent or persistent erections; hoarseness; mood or mental problems; more hair on the face; nausea; new lumps or pain; swelling of arms or legs; trouble sleeping; trouble urinating; unusual bruising or bleeding; vomiting; weight gain; yellowing of the skin or eyes. This is not a complete list of all side effects that may occur. If you have questions about side effects, contact your health care provider. Call your doctor for medical advice about side effects.